The family Oweniidae is composed by about 50 species of medium sized, tube building annelids with worldwide distribution, ranging from littoral shallow waters to the deeper continental shelf and slope. 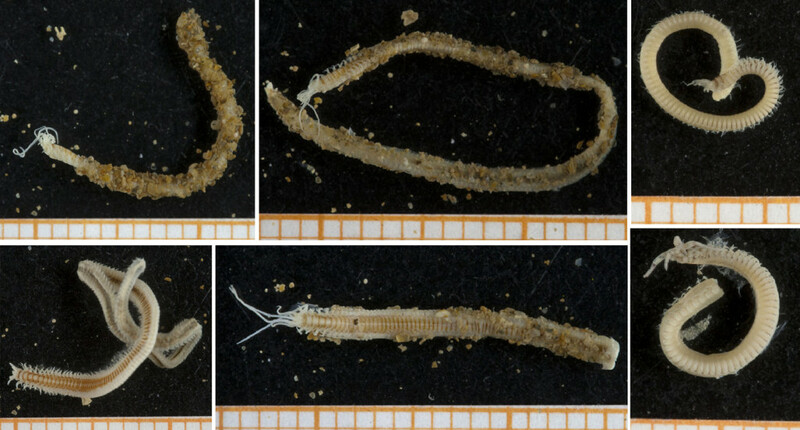 They live in tubes made of sand, mud and/or small pieces of shells they select from the sediment. Very few oweniid species have been reported from west African waters so very little is known about their diversity. During a two week visit to the University Museum of Bergen in 2016, 5 lots with about 100 vials with near 250 oweniid specimens from West Africa collected during several sampling campaigns of the ship R/V Dr. Fridtjof Nansen in Morocco, Mauritania, Senegal, Guinea-Bissau and Gulf of Guinea (Ghana, Gabon, Benin) were studied. Several already described species of three genera (Owenia, Galathowenia and Myriochele) were identified, but other potential new species belonging to these genera has been also observed among this material, which is largely based on the MIWA collections. For each species, both of those already known and those still undescribed taxa and recorded as morphotypes, several specimens were selected for DNA barcoding which was done during 2017. Once this analysis is finished, a new stay at the UMB will be done in 2018 to finish the morphological study. 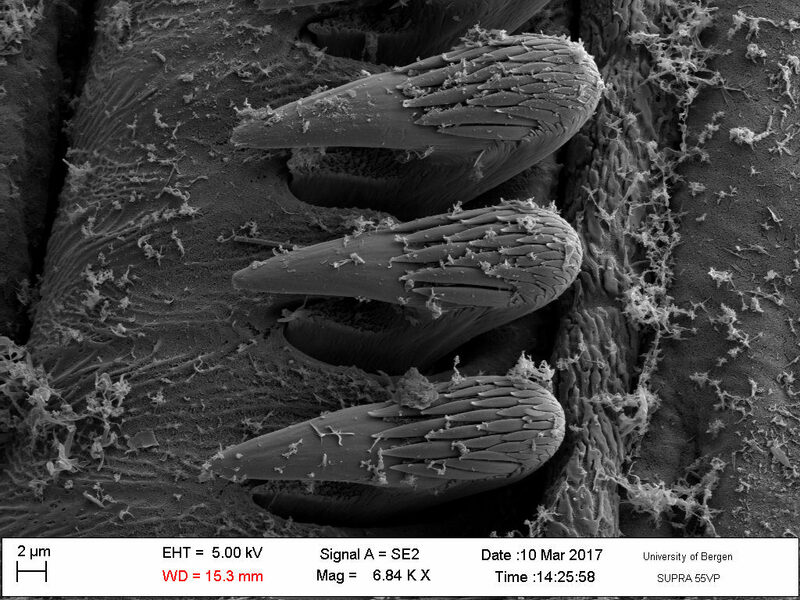 Formal descriptions of each taxon will include line drawings done with the aid of a camera lucida and compound microscope, and SEM photos of well-preserved specimens, to document those characters with taxonomic relevance. This work, which will be mostly done once back in the UDC in collaboration with Juan Moreira (Universidad Autónoma de Madrid, Spain), will be combined with the molecular analysis and published in one or several papers by the end of 2018. 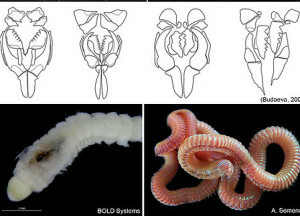 Polychaetes in the family Terebellidae – the spaghetti worms – have a global distribution and include over 400 species of tube dwelling worms. Particular attention has been given to the species belonging to the genus Pista, occurring in Northern European waters, as well as to species in the subfamily Polycirrinae from Western Africa. Manuscripts are currently being prepared on at least four species of Pista that have previously been confused due to the lack of taxonomic boundaries. Thehe diversity of Polycirrinaefrom Africa has not previously been studied . During several research visits 43 species of terebellids belonging to 16 different genera has been identified from material collected along Western Africa; a high polychaete diversity in one family, and it will get even higher as new species are described. 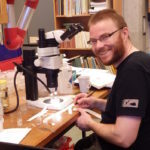 In this way, we are corroborating that the biodiversity on polychaetes is still underestimated, and that we continue to encounter of new species or new records in each new region that is being investigated. The morphological descriptions of each species will include compound microscope photos of stained specimens, SEM photos and hand-drawings, in order to document the characters distinguishing the species; something that has not always been not well documented in the past. All this information in both the Pista and Polycirrine clades is combined with molecular analysis; thus, we are joining a couple of disciplines that were considered exclusive in the past, but complementary in the present. 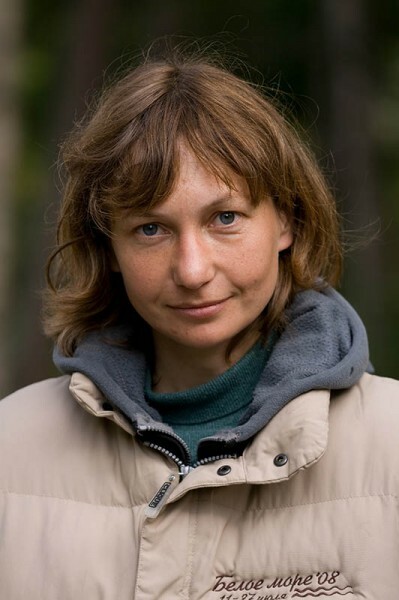 ¡Our final remark is that we are trying to solve taxonomic problems, not to increase them! The Ampharetidae is a family of small to medium sized, bottom dwelling annelids with worldwide distribution, ranging from the shallow to the deepest ocean. They live in tubes which they construct from sediment. Few species of ampharetids have been described from African waters, and very little is known about the diversity of species along the West African coast. 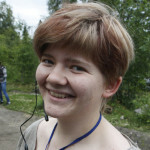 Previous works include Augener (1918), Fauvel (1936) and Kirkegaard (1959). Our studies reveal that ampharetids are in fact quite prevalent in West African waters, occuring in the majority of our samples. Insofar as possible, specimens were identified to species or genus. In cases where the specimens did not match any species description – and thus may be new species – temporary names were assigned. For each recorded species, a number of specimens were selected for DNA barcoding. 209 specimens from 42 morpho-species were submitted for barcoding. 71 sequences from 30 morpho-species were obtained – a somewhat disappointing success rate of 34 %. Despite the low success rate, the sequences we did get clusters into 39 OTUs, (“BINs” in the BOLD system), indicating that the diversity may be even higher than estimated. 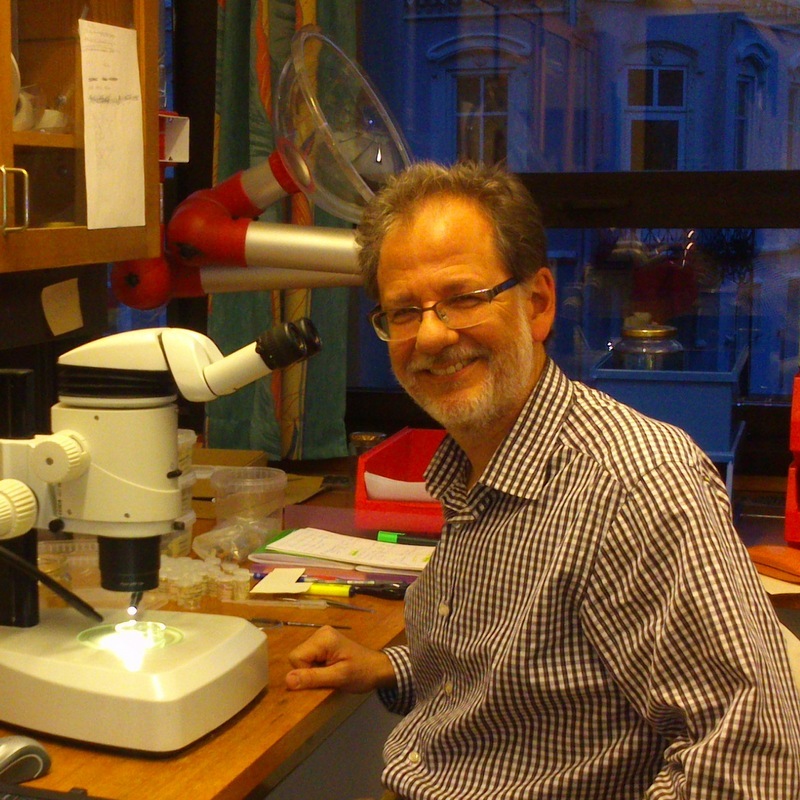 Work continues with delimiting and describing new species. Augener, H. (1918). Polychaeta. Beitrage zur Kenntnis der Meeresfauna Westafrikas. 2(2): 67-625, plates II-VII. 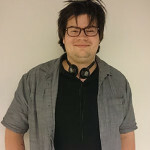 Kirkegaard, Jørgen B. 1959. The Polychaeta of West Africa Part I. Sedentary species. Atlantide Report, 5: 7-117. Fauvel, P. 1936. Contribution a la faune des Annélides Polychètes du Maroc. Mémoires de la Société des Sciences Naturelles du Maroc, 43: 1-143. Together with collaborators from Ghana and Nigeria we are integrating morphology and COI-barcoding to investigate the species diversity of Glyceriformia in our material. Insofar as possible, specimens are identified to species or genus level using available literature with keys or morphological descriptions. In cases where the specimens do not match any species description and may be new species, temporary names are assigned. For each recorded species, a number of specimens are selected for DNA barcoding. 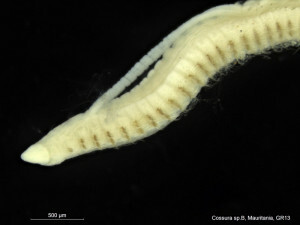 The Magelonidae is a family of marine bristle worms with a world-wide distribution, generally found in shallow waters. 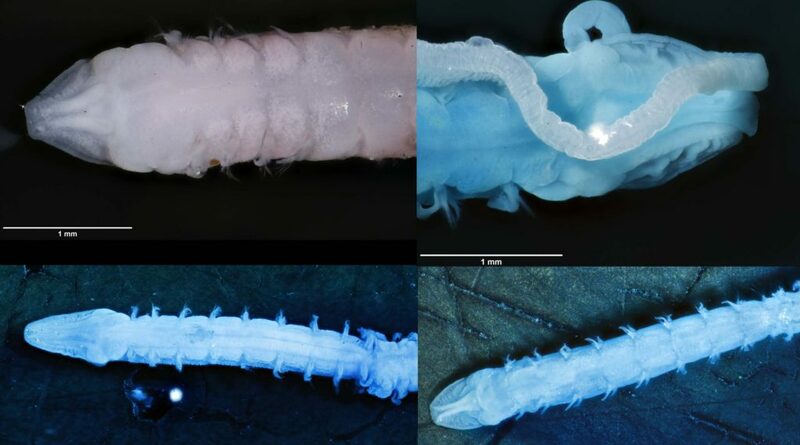 The worms have a unique flattened, spade-like head region, which they use to dig in soft sediments, giving the group its common name, the shovelhead worms. Very few species of magelonid from African waters have been described and very little is known about the diversity of species along the western African coast. Using material from MIWA collections the project aims to revise the magelonids from this region. 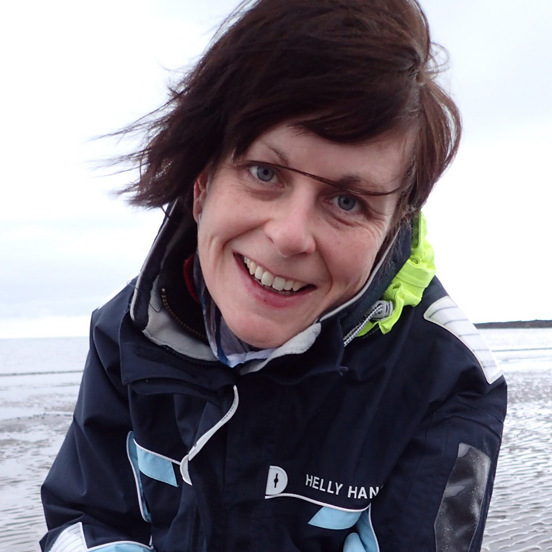 Kate visited Bergen in November 2015 to identify material of 20+ putative species for barcoding. 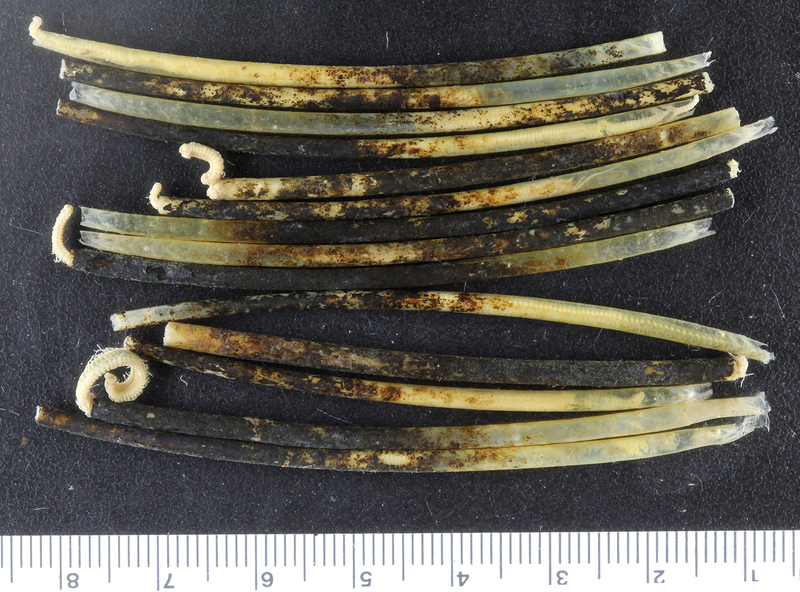 Further material for barcoding will be identified at the University Museum of Bergen during January 2017. Morphological drawings and species descriptions will be made back in Cardiff. 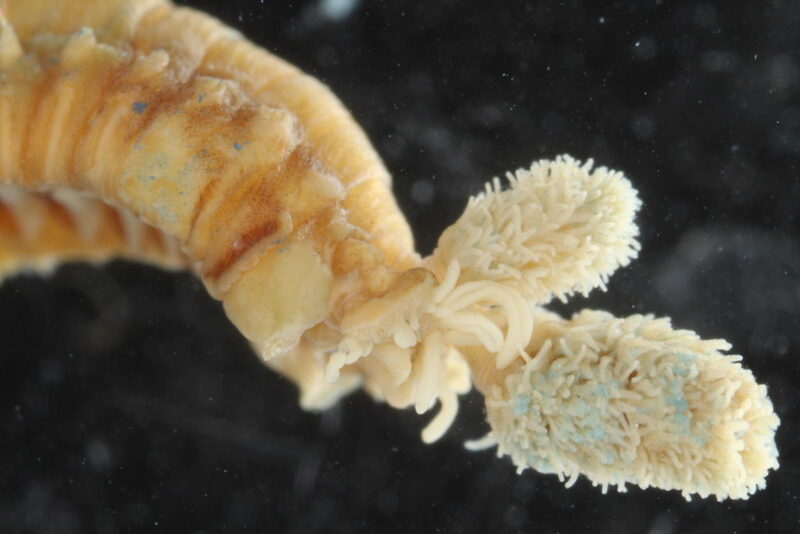 Hyalinoecia is a genus of deep-sea onuphid bristle worms with world-wide distribution. The worms have quill-like totally secreted organic tubes that they drag along while crawling on the sea floor in search of food. Hyalinoecia shows extremely high intraspecific variation of all diagnostic morphological characters resulting in erroneous identifications of the species. For example, Hyalinoecia tubicola has been widely reported in the literature as a cosmopolitan species. Nevertheless, this has not been tested with molecular data. 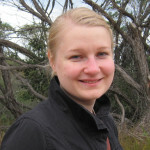 In the current project, Nataliya attempts to revise the genus utilizing molecular data and species delimitation approaches. 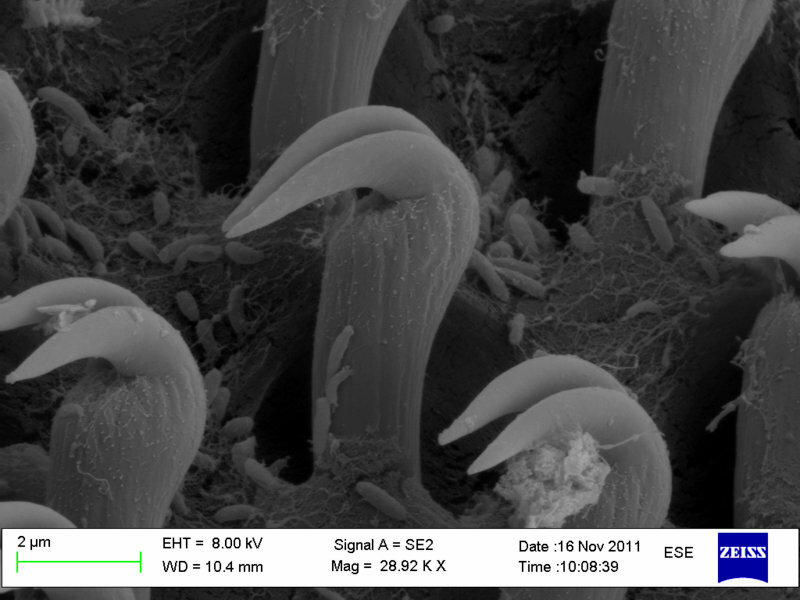 Hyalinoecia is very common in MIWA materials providing high number of specimens for genetic analysis. Onuphis is the type genus of the family Onuphidae reported world-wide mostly in shallow waters and comprising approximately 40 species. The genus has never been revised completely and taxonomic status of many species remains uncertain. 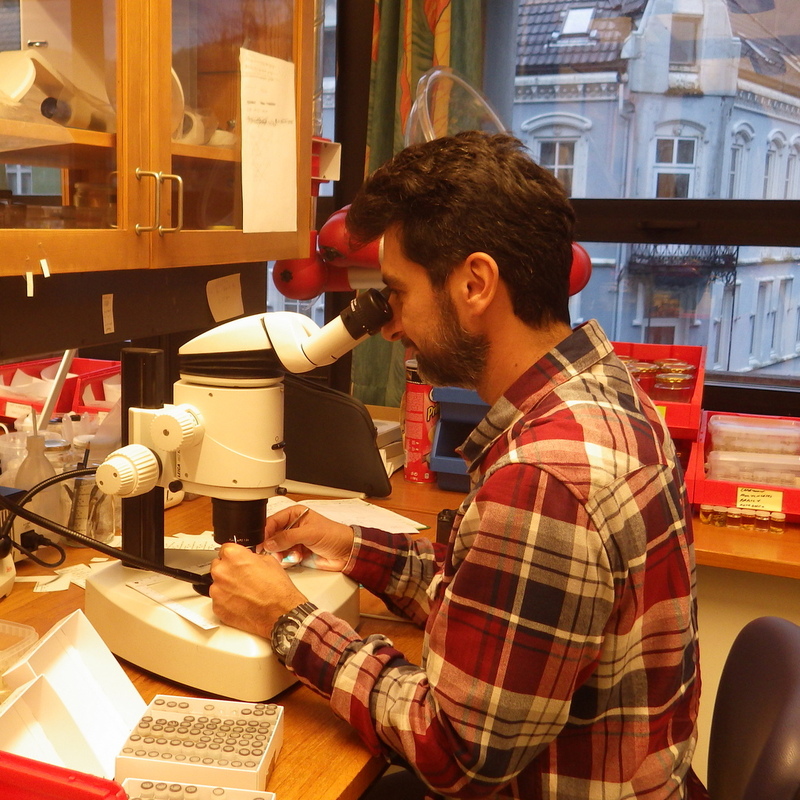 Andres has been working on Onuphis from the European waters and has recently published two papers (Arias & Paxton, 2014, 2015) revising the European fauna of this genus. He will come with a one-week visit (November 2016) to the University Museum of Bergen to study Onuphis from West Africa. The project aims to revise the fauna of two families of bristle worms, Cossuridae and Orbiniidae, from West Africa. 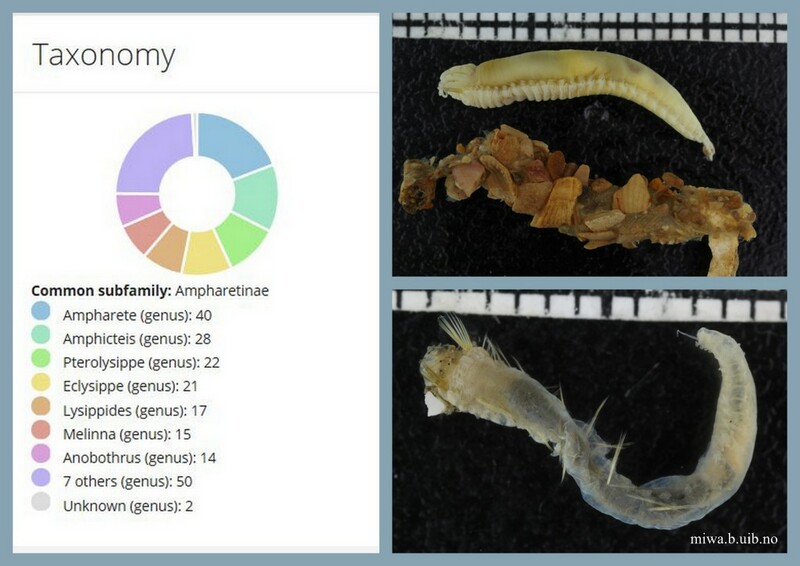 During her 2-week visit in 2016, Anna has studies the collection of worms from these two families. These annelids have poor external morphology allowing only preliminary identification of studied specimens to morphotypes. 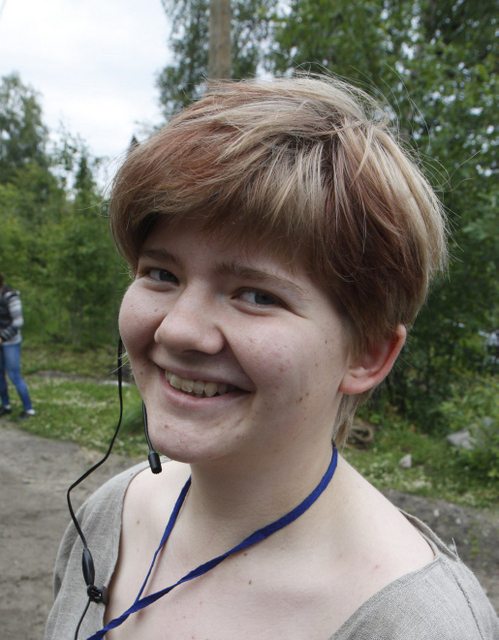 Anna plans to utilize barcoding tools to estimate the number of putative genetic species in both families. This will allow identification of species with confidence and subsequent description of potentially new species. 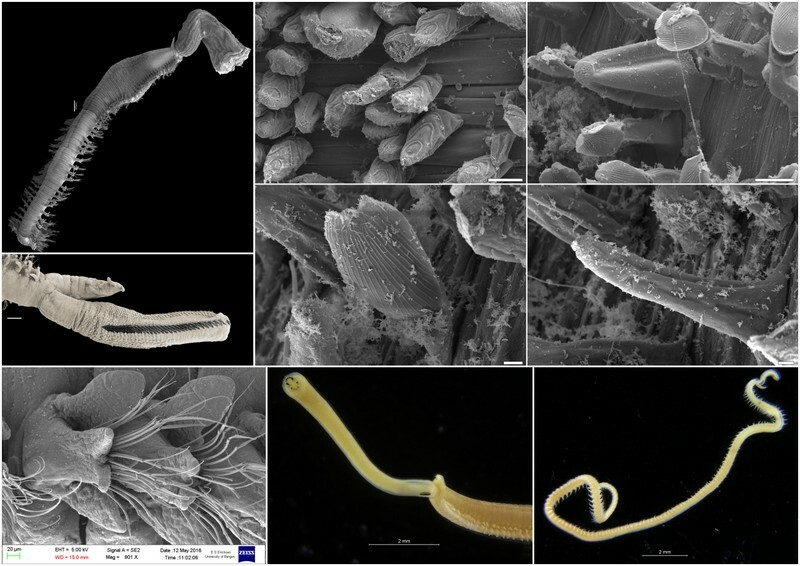 Lumbrineridae is a highly diverse family of bristle worms with world-wide distribution. Despite their poor external morphology and lack of apparent distinctive morphological characters they comprise 19 genera erected mainly based on the structure of the complex maxillae – the upper jaws located in the muscular ventral proboscis. The project is largely based on the MIWA collections since the generic diversity of Lumbrineridae in West Africa is very high. The aim of this master project is to provide the first molecular-based phylogeny of Lumbrineridae utilizing nuclear and mitochondrial markers and to compare it with published phylogeny based on morphological data. This will help to access monophyly of the most species-rich genera and to trace the evolution of morphological characters (e.g. the presence of compound anterior falcigers, shape of maxillae, presence of parapodial lobes, etc.). 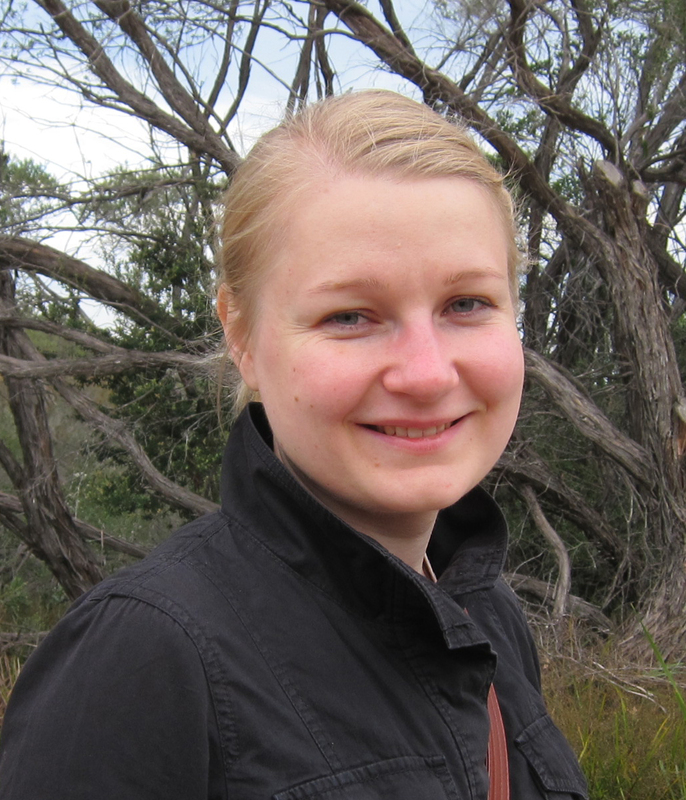 During her project, Polina has studied about ninety specimens of Aponuphis from 22 stations off western African coast from Morocco to Angola using light and scanning electron microscopy. 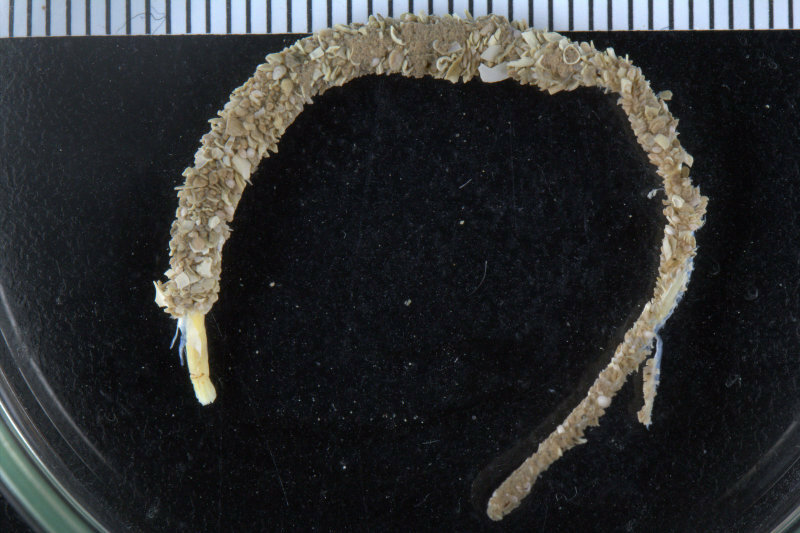 A fragment of 16 rDNA was obtained for 31 specimens of Aponuphis and two specimens from a sister genus Onuphis. Neighbor joining analysis revealed the presence of two species complexes (A. bilineata species complex and A. brementi species complex), A. ornata and a potentially new species Aponuphis sp. Aponuphis are known to have various color patterns that have been traditionally used in species identifications. Besides three typical color morphs characteristic to A. bilineata, A. brementi, and A. ornata, the large number of specimens displayed indistinct color pattern of transversal pigmented bands or dots on anterior chaetigers. Specimens with such coloration were found in A. bilineata, A. brementi and the new species Aponuphis sp. 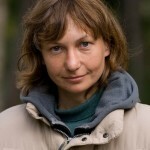 The project has resulted in a manuscript which has been recently submitted to a peer reviewed journal: Borisova P. Budaeva N., Schepetov D. Aponuphis Kucheruk, 1978 (Annelida: Onuphidae) from western African waters. Invertebrate Zoology (submitted). 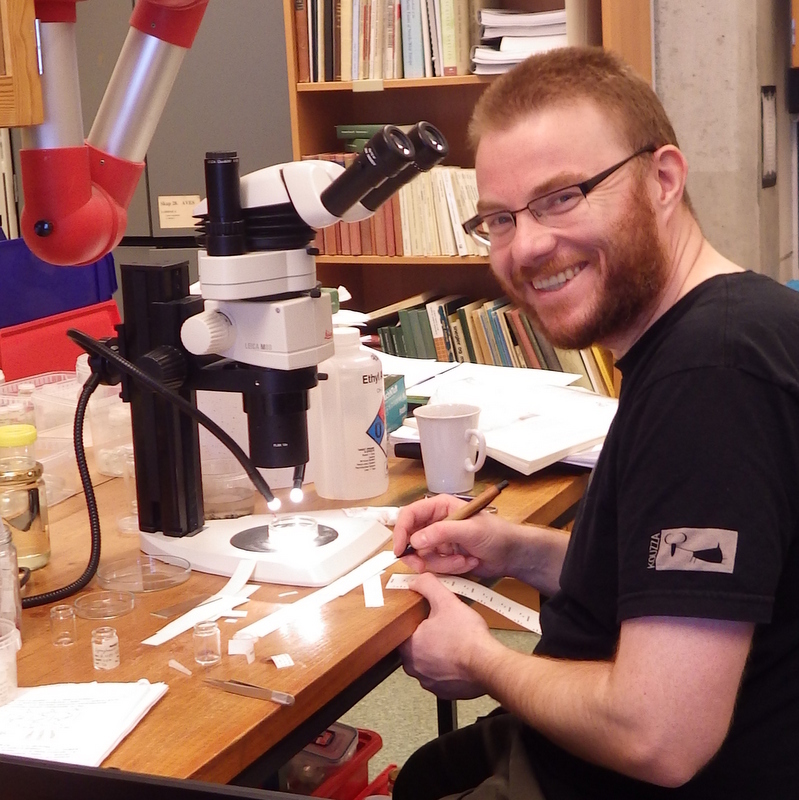 During his project, Martin has studied an extensive material of Diopatra polychaetes from the shelf areas along the West African coast collected by R/V Dr Fridtjof Nansen. He learned the basic methods of taxonomical work such as light microscopy, preparation of slides of parapodia, digital photography as well as scanning electron microscopy. He also worked in the DNA lab and obtained a good number of sequences of 16S rDNA and COI for most of species he had in hand. 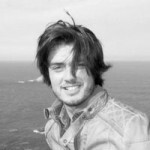 In his thesis, Martin has described nine new species of Diopatra and found four more species previously reported from the area. He also provided phylogenetic analysis of Diopatra and reported few previously overlooked morphological characters that appeared to by synapomorphies of well supported clades within the genus. 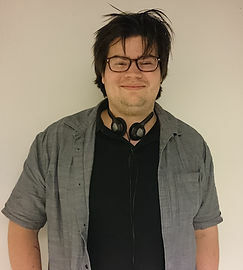 After successful defence of his thesis, Martin continued to work on Diopatra and has studied type materials from the Hamburg Museum and obtained new genetic data. Currently Martin, Nataliya and Endre are working on the revision of Diopatra from East Atlantic based on morphological and genetic data.